Have you ever stood at a cash machine and received a friendly tap on the shoulder to alert you to a discarded £20 note on the ground? If so, then shortly afterwards - after you crouched to pick it up - you probably noticed that your card and perhaps the cash you were withdrawing had disappeared. 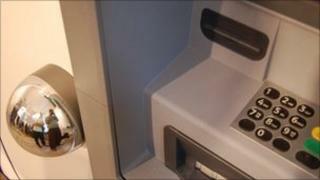 Some £33m was lost to cash-machine fraud in the UK in 2010. Although the figure has been falling in recent years, the industry is still trying to find ways of reducing it further. As part of this, 13 students were commissioned to come up with designs to make ATM use safer. Not all of their ideas will make it into production, but some - which have been exhibited at Central St Martins College in London - do raise some interesting views on how consumers can be safer when they take out their cash. ATM fraud caused losses of £45.7m in 2008 and £36.7m in 2009 in the UK. Much of this was the result of distraction thefts, and some of the ideas in the Design Against Crime exhibition highlighted ways of ensuring strangers, and potential thieves, did not enter the ATM users' personal space. ATM ball mirrors by Satoru Kusakabe allows people to see who is around them, by attaching the two round mirrors in their peripheral vision at either side of the ATM. "It should be cheap and easy to fit," says the 26-year-old student from Tokyo. The design caught the attention of Graham Mott, head of development at Link, which oversees the UK's ATM network. "Some ideas are more practical than others, and this would be very easy to do," he says. "This is an evolving process. We have seen over time that criminals' techniques have changed, so we need to change, too." Another way of keeping strangers back from an ATM when it is in use is Philemon Tcherkassof's queue pole, which he says taps into people's subconscious by making them wait behind the physical boundary. Similar techniques have been trialled to create a safe space around ATMs, such as a marked box, and even street art, which prevents people standing too close to the cash-machine user. Marcus Willcocks, research fellow at Central St Martins, who oversaw the project, says that the students were given a brief to reduce the opportunities for thieves. This could include preventing the snatching of cash, and reducing the chances of opportunists peering over the shoulder of somebody at a cash machine. Many machines carry a warning to users to ensure they shield the keypad when entering their four-digit Pin code. Zsofia Ujhelyi, a 24-year-old student from Budapest, has created a design which means the ATM will not work unless the keypad is shielded. Users would have to press a series of buttons with the side of their hand to show that they are covering the keypad when entering their Pin. Charlie Rohan, of NCR, a major manufacturer of ATMs which part-funded the project, says the students' ideas will feed into work carried out by the company's own engineers in Dundee. Some designs, he admits, will be rejected because of practicalities - such as requirements that the machines do not cause a problem on narrow pavements. These issues often arise when planning permission is sought for new ATM locations. A new range of ATM designs is brought out every three-to-five years, including new behind-the-screen protection technology, but machines need to be made so they can be updated and upgraded. Ultimately, he says, designs should encourage people to change their behaviour to ensure they protect their card and code. NCR has also funded work from Delft University of Technology in the Netherlands. Students there will exhibit their ideas this week on how technology can be used to reduce ATM fraud. How much forged money is in circulation in the UK?